We are watching another act of the tragedy called the death of Nokia. Earlier this year, I devoted the entire 155th issue of the Spillikins to Nokia’s yearly results and the company’s perspectives. You can look it up since what we are seeing now is a logical repercussion of the things I was talking about back then. In that article I expressed my surprise at the speed at which Nokia was falling apart but I could not have imagined that it would practically be a free fall. Nokia’s management has learnt a few PR tricks to assure the market that they are doing just fine while Nokia has already passed the no-return point and there is hardly any chance that the company as we know it will remain. For 14 years Nokia was the world’s Number One mobile phone manufacturer but has lost this status recently to Samsung. Today I don’t want to discuss Samsung’s right strategy, their bet on Android and other obvious things. I want to look into goings on inside Nokia and what is in store for the company. I want to add that something as big as the fall of Nokia only happens once in 20-30 years on world markets and make a big difference. In a few days we will release a regular issue of the Spillikins. This article is dedicated to the former leader of the mobile phone market and I want to begin with Nokia’s attempts to storm the US market. The US mobile market is the most important market in 2012 for all manufacturers. The reason for this is that the American carriers who are now massively switching to LTE networks thus ordering LTE smartphones (LTE smartphones already amount for over 50% of smartphones in the US). It means that the average phone price in the US is higher than on any other market in the world. The manufacturer who manages to get ahead of the competition in the US will receive a powerful boost to his business. In the recent years Samsung has been dominating the US market. Galaxy Note is a good example of the huge capacity of the American market – since its release around 2 million units of this smartphone have been sold. Worldwide 3 million Note handsets have been sold for the last three months. I think this proves just how important the US market is. It was not the first time Nokia tried to corner the American market – they have been making attempts for the last decade. Nokia created exclusive offers for carriers, spent obscene amounts of money but to no avail. One of their biggest endeavors took place in 2007: they turned their San Diego office with 200 employees into a AT&T support service. Nokia came up with very attractive offers for AT&T and designed a AT&T exclusive – Nokia 6555, a flip phone for $49 with a two year plan. The problem was that AT&T did not feel like promoting this phone and took a neutral stance. The business of AT&T is not imposing a certain phone on their customers but to provide services and make sure their clients are happy. They won’t try to sell anything the customer does not want. In 2007 Nokia paid for the opportunity to demonstrate their product to customers and that initiative failed. Nokia even had to sell this phone designed exclusively for the US on other markets to get rid of the stock. In the same time Nokia created a fund in Palo Alto in order to find promising start-ups and invested $200 million into that project. It was a part of their 2007 plan to conquer the US market and it failed. Nokia’s hopes are voiced in a 2007 interview to Forbes – check it out and compare with the Nokia’s current attempts to make a comeback to North America. In 2012 Stephen Elop has been telling us that the company is intended to make a serious comeback to the US market with the help of Windows Phone 7 and the Lumia smartphone series. In early 2012 Nokia launched Nokia 710 for T-Mobile with great pomp but in just a week its price fell from $49 to zero with a two year plan. The sales were very poor it was just like in 2007 when the low recognition of the Nokia brand hampered the sales of Nokia 6555. However, in 2007 Nokia still had 10% of the US market and some Americans still remembered this brand unlike in 2012. In January at CES 2012 the Nokia showroom was surprisingly small and located humbly far from the center. The company was afraid of a direct comparison of their products to the rivals so it was a right thing to do from the point of view of PR. Just like the fact that Lumia 900 was named the best smartphone at the show which is now being used in every ad. However, back in January Nokia did not tell the price of this smartphone or its release date. The rumor suggested March 18 but it did not happen. Nokia successfully maintained the public interest. In March we learnt that Lumia 900 AT&T was going to cost $99 with a two year plan. Many people were excited by this news since Apple iPhone 4s costs $199. But it was all just a marketing trick creating the aura of a successful product. 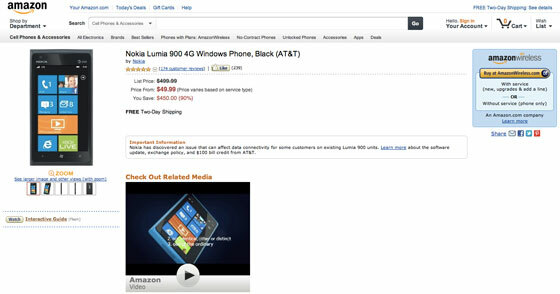 By the release date Nokia knew that they had to create an instance in which Lumia 900 would prove to be successful so they cut the price on Amazon in half to $49 with the same plan. The release date was announced – April 8. It’s Easter in the US so most stores are closed. It is not out of the question that Nokia’s US division did not know that but it was probably because Nokia wanted to limit the sales in real stores in favor of Amazon. 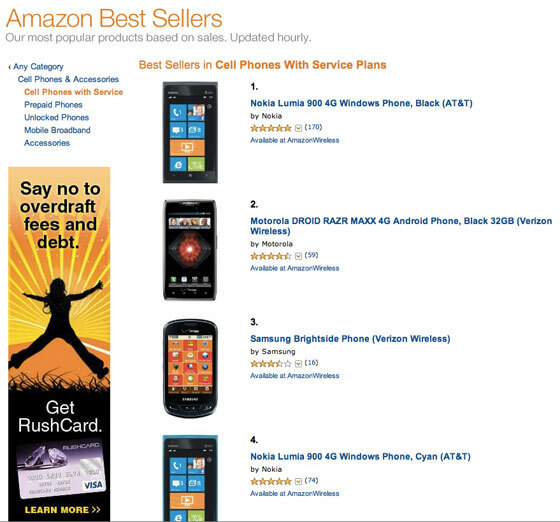 Many journalists wrote about this ridiculous release date but Nokia managed to create a hype around high sales of Lumia 900 on Amazon. The actual sales began on April 10 when most AT&T stores received Lumia 900. In preparation for the Lumia 900 release Nokia made three promo videos in which they raise technical issues of Apple iPhone like bad reception, display issues etc. And although in the video they did not name the device it was clear they were criticizing the iPhone. Seems to me like a pretty daring move for a company that has been avoiding any comparison with rivals. Anyway, it’s all in the past – today Nokia resorts to all sorts of tricks. You can find Nokia 900 commercials on the smartphonebetatest.com portal but all the early viral ads are gone. The irony is that Nokia never told in their ads that their phone is better they just said it worked which as the first Nokia 900 owners learnt was not true either. On April 10 already there were the first complaints on the reception loss in 3G and 4G AT&T networks. Users had to reinsert the SIM or restart the phone to make it work. The Nokia flagship turned out to be a very crude piece of work and the company rushed to fix the problems. A solution was founded and the company announced that a new firmware fixing the bug would be released on April 21. Nokia developers managed to solve the issue in a very short period of time – the firmware was ready three days before the announced date. Some praise would be due but I’d rather praise developers who release something that does not need fixing. 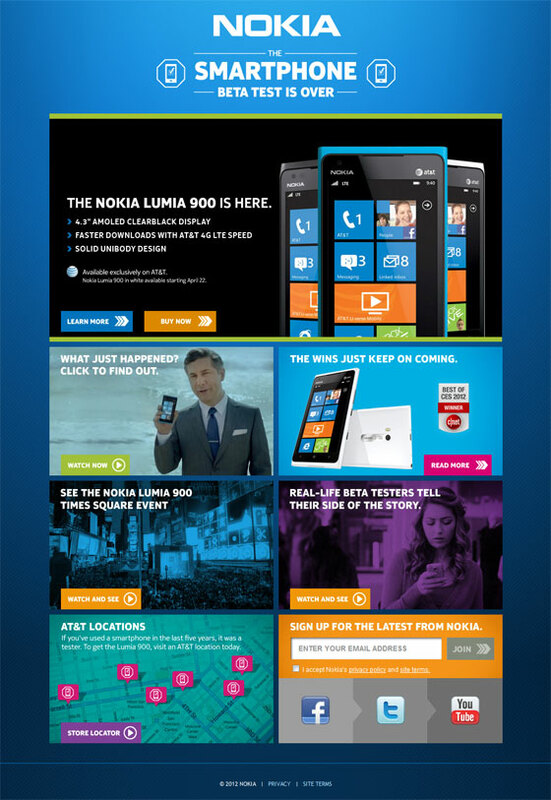 All the issues of Lumia 900 come from the general situation in Nokia. The company has slain its R&D division, closed several departments worldwide and has had major staff problems. Nokia’s best engineers have long fled to rivals, many found a new job with Samsung. It is only natural that a company in this condition trying to keep up with the market and the rivals cannot produce quality products. But even if all that was not a problem, Nokia has only been working about a year with Qualcomm chipsets so their developers and engineers have very little experience. Nokia’s previous flagship Lumia 800 had battery issues from the very release and it took several months and firmware updates to solve them. It is a nice example of what sort of stability you can expect from Nokia products. Let’s see now how Nokia is going to deal with Lumia 900 issues. Besides the announcement of firmware updates Nokia made a really generous move and cut the price from $99 to only $0.99. If you have already bought a Lumia 900 then AT&T will reimburse you a hundred bucks. Moreover, after admitting the hardware faults Nokia declared that all buyers of Lumia 900 will receive $100 until April 22. Such a generous promo surely cost very dearly. Just imagine that you draw a budget and then you learn that every single unit you sell cost you an extra $100. It is possible that this bonus is included in the $150 million Nokia gave to AT&T for promo support but anyway it is hardly profitable. Let’s compare Nokia’s reaction to how Apple handles a similar situation. Apple is now the richest consumer electronics manufacturer and makes 80% of the world smartphone market profit. When the story around the faulty antenna in iPhone 4 made a lot of noise in the media Apple reluctantly offered free bumpers which only cost Apple a few cents apiece. The biggest difference between the companies is that Apple is making money because they just know the math. Nokia is being extravagant and fail to see into the future. Nokia surely made a successful PR move by quickly accepting responsibility and generously reimbursing their customers but the costs are just too high. In a similar situation Apple managed to maintain high sales and keep all the cash. Guys at iSupply love to put a phone apart and count how much its parts, body and assembly cost (an approximation but a rather precise one). A few days ago iSupply got their hands on a Lumia 900 and learnt that it costs Nokia at least $217 (we must also include a WP7 license fee but since we don’t know how much it is let’s just keep it in mind). 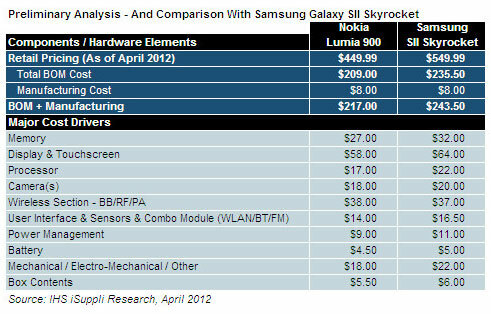 iSupply also compared Lumia 900 with Samsung SII SkyRocket as the closest hardware match. BOM cost of SkyRocket is $243.5. If we compare the retail prices then we’ll learn that the price of Lumia 900 is 46% its production cost while Samsung SII cost is 43% of the price (it is also a hundred bucks more expensive). So the production costs are similar but Nokia also pays much bigger money for marketing, ads and OS fees. In the end it is clear that Nokia phones are a lot less profitable. A more detailed analysis of the hardware inside Lumia 900 here. Some components inside the Samsung phone are more expensive like the CPU. This means that as soon as Nokia switches to the next gen hardware the production cost will go up. It is very important because Nokia will not be able to use price dumping on the smartphone market without losing money. Naturally, it is very interesting to see Nokia 900 put against Apple iPhone 4s which has become the example of business efficiency. 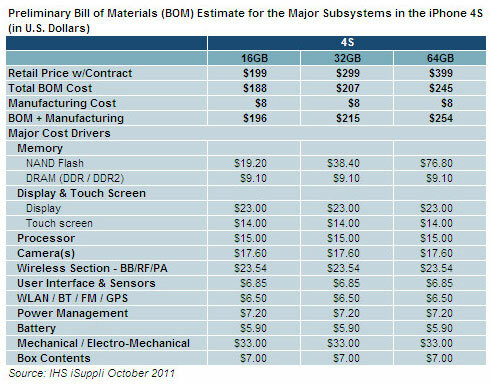 The production cost of iPhone 4s is the smallest among the mentioned smartphones and is only $196 for the 16GB version. You can find a detailed analysis of the components cost of iPhone 4s здесь. The main idea I am trying to convey is that Nokia does not have any price or production cost advantages as compared to its rivals. So if a price for a Nokia product is lower than the price of a rival product it means Nokia is losing money selling it. The $100 bonus for Lumia 900 till April 22 is losses for Nokia per every sold handset. Nokia longs for successes so they end up making them up. Nokia has already used this trick when instead of sales figures they report how high their products are displayed on the Amazon page. With the release of Nokia 900 in the US I was surprised to learn that the online store had become for some reason a gauge of success for some. The thing is Amazon posts a list of best selling phones in their store. Nokia used this list as a proof of success of Lumia 900 and thus the company. I have some bad news for the PR team of Nokia. Firstly, Amazon is just one of many online stores and it is not even the biggest one in the US. And as far as phones are concerned Amazon is far behind carriers in sales. Secondly, whatever Amazon posts on their homepage – it tells you nothing about the market in the whole. Nokia 900 Black and Blue were number one in that list for a few days. The Amazon best selling phones list is here. The blue Lumia 900 has been steadily going down on that list – the last I checked it was sixth. 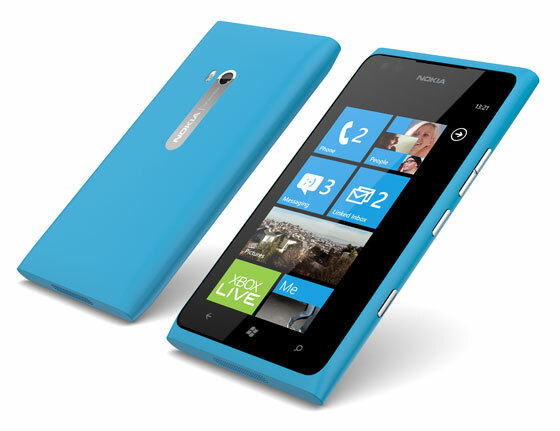 Does it mean that Lumia 900 in blue is getting less popular? No, it does not mean a thing. It is utterly pointless to correlate Amazon sales with the whole market sales. If you looked on my table and saw three phones: Lumia 800, 710 and 900 what conclusions would you make? That these are the most popular phones in the world? Naturally not. Such PR tricks can only work on people who don't think about what stands behind figures. I am quite sure that in Q3 when Nokia 900 sales figures will be released they will 'suddenly' turn out to be not quite so impressive as the company is trying to assure us. In Q1 Nokia only managed to sell 2 million Nokia 900 handsets but they kept on insisting that it was a best seller. Well, Nokia might have a different understanding of what a best seller – in case of Lumia 900 'best seller' stands for 'well, at least we don't have to throw them out'. On February 11 2011 Stephen Elop launched his Nokia destruction plan and in April 2012 we finally got proof of that. Nokia issued a press release anticipating negative Q1 2012 financial data. 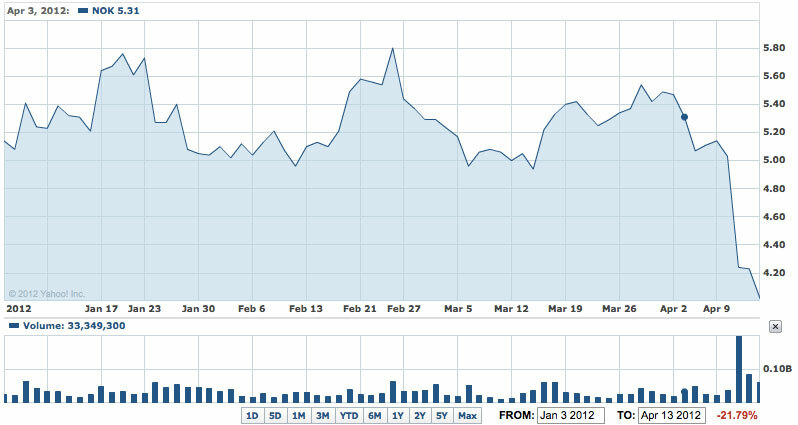 Nokia plummeted that day by 18% and 8% more the day after and has recovered slightly since then. That's a quarter of Nokia's value gone in just two days because the Q1 results were not just unpromising – they were catastrophic. Year on year Nokia lost 50% of smartphone sales which is the fastest growing mobile market. In the same time they lost 16% of regular phone sales. Quarter on quarter losses look even more dramatic but there might be a seasonal factor. Another interesting fact: Nokia's Mobile Devices department depreciated in a quarter from €5.581 billion to €4.9 billion through selling off its assets. Nokia claims that the sale was caused by an unhealthy market situation and there will be no more sales. I think Nokia had to do it to support sales at any cost but it cannot go on like this forever. And though Nokia's asses are huge so far they will only be able to last this way for four to five quarters – the €681 million losses speak for themselves. Moreover, Nokia stated that they are not expecting a better result in Q2 2012! Q1 2012 main outcome is the fact that Nokia has lost the number one manufacturer status to Samsung. The average price of €220 for a Lumia phone is an alarming issue. I guess it includes all the ads and promo campaigns. And that's when the company does not have any back up plans. The stock market reaction has been logical: since the start of 2012 Nokia stock depreciated by 21.7% and most of that fall after the Q1 financial report release. Since January 2011 Nokia stock has depreciated by 62.3%. I am afraid that this is only the beginning and the stock market will only make more difficult to climb out of the hole as Nokia becomes an object of stock speculation because of the obvious declining trend. The matter is aggravated by rating agencies who have lowered Nokia credit rating once again which means that loans will become more expensive for Nokia so the entire business environment is getting worse. The next chapter is about what the future has in store for Nokia. Stephen Elop has mentioned that Nokia is in-between a transition period and they do not expect the results to be any better in Q2 2012. Talking about the competition Elop said that Nokia is going to continue an aggressive price policy and promoting the Lumia series. This statement can tell us everything we need to know about the future of Nokia. Other companies have already been there and did that: Siemens Mobile, Sony Ericsson, Motorola. As soon as their phones lost most of their popularity because they could not compete with rivals all those companies panicked. And they all reserved to price dumping. On a tactical scale it works as cheap phones are always in demand but in a long term it is a road to nowhere. The reason this does not work is because instead focusing on bettering their products they respond with a mere market repositioning of their products. And it works to a certain extent. Today a lot more people can afford a mid-range Nokia. Meanwhile, however, Nokia is cutting their R&D and testing budget. The dumping also causes the second-hand market of Nokia phones to boom and become a rival of the new Nokia market. Who are those who buy second-hand phones with a 25-30% discount? Usually they are low-income buyers and it is another factor in the market repositioning of Nokia products. There is a sudden but a short term boost to sales. The R&D cuts soon translate into poor quality. All other dead mobile phone manufacturers have been there and none of them managed to get out of this vicious circle. I am pretty sure that Nokia will soon resort to a massive price dumping but should not concern other manufacturers because the production cost for Nokia are growing by the day meaning they will not be able to set competitive prices soon. Nokia will only be able to dump when they amass a big enough stock – it will be similar to 2011 when the company was losing the market in jerks. The Lumia series is another issue. Very soon there will be nothing left of Nokia but its Windows Phone division. For Microsoft it is a win-win scenario as Nokia will do anything to sell more Lumia phones. But for Nokia it means ditching their most loyal buyers by making them switch to WP and they have not been successful in doing so too. During an interview with analysts Stephen Elop mentioned that the company is seeking ways to replenish their bank accounts. This means that he will continue to sell Nokia assets. Nokia has already sold a dozen of subsidiary companies and a number of patents. In 2012 Nokia is going to sell most of what they have been amassing for decades. Unfortunately, selling of the company bit by bit cannot save Nokia, it can only postpone the inevitable. 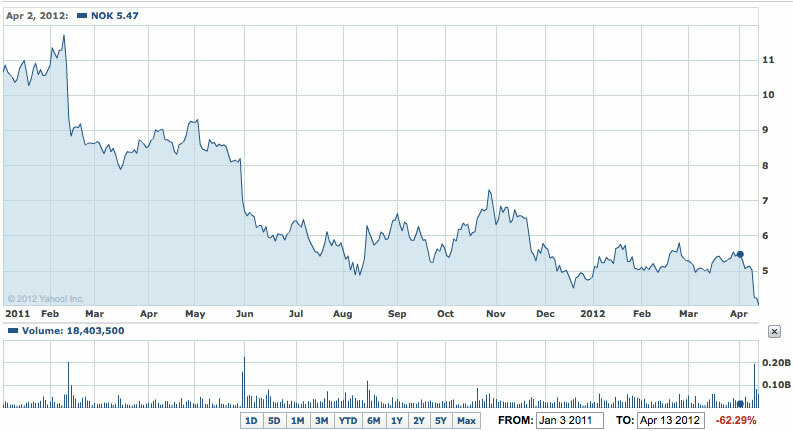 Q4 2011 results prove that selling off the company does not help it only serves as a financial damper. In the long run the risk is getting nowhere with nothing and having to start the business from the scratch. My vision of the Nokia future is pretty simple: Nokia’s market share will continue to shrink and will reach its minimum probably in the summer 2013 when several Chinese manufacturers will take over Nokia in sales and it will be far from its current number two status. Nokia was the market leader for entire 14 years and the current fall is unbelievably fast. Windows Phone products are the key Nokia merchandise and a lot will depend on whether Nokia will be able to offer interesting WP7 products. But even if they do it will not save the company as we knew it. P.S. Have a nice week and enjoy the spring!